January blues refers to that unsettled and unhappy feeling after the holidays are over. The joy and excitement have come and gone, and now there is nothing to look forward to. Of course, Imbolc isn’t so far away, so as a Pagan it’s probably a bit easier to cope with! But winter depression and SAD can affect anyone, so it’s important to keep an eye on your mood at this time of year and try and do something positive if you feel yourself becoming anxious or feeling low. Here are some excerpts from a book I contributed to which has magical tasks for every day of the year. 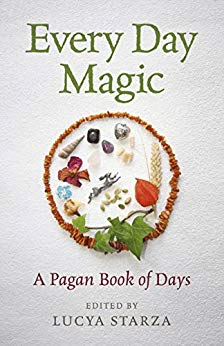 Every Day Magic: A Pagan Book of Days is a collection of 366 ways to observe the cycle of the year. These ideas can help make a grey and dismal January as magical as you need it to be. We have come to wassail thee. Now winter lessens here at last. Then sing and dance, have lots of fun. Do blossom well we beg o’ thee. To bear and to bow apples enow. Hats full! Caps full! Three bushel bags full! What do you do to keep yourself joyful in January? However you spend this first month of the Gregorian year, may you be warm and merry in some small and special way. An interview with Shaheen Miro, creator of The Lunar Nomad Oracle. His inspirations for his deck and how he feels cards should be read. Plus, our Lynn gives her thoughts on the Deck. An Exclusive Excerpt from The Ultimate Guide to Tarot Spreads by Liz Dean. Learn a spread taught from the pages of the book. A free taste! Not only that but the Publishing House The Quarto Group is giving OUR READERS a 40% OFF coupon on tarot gear for the month of JUNE!!! Witch & Popcorn…is a new monthly column that will feature a review of a Witchy TV series or Movie each month. This month…The movie “The Last Witch Hunter” starring Vin Diesel, the immortal Michael Caine, and Elijah Wood. For My Witches in the Wardrobe…Being a Witch can be difficult when you have to hide who you are. This column is meant to be my love letters of support to my fellow witches, but those who must hide. I want to share thoughts, ideas, & crafty ways we can be spiritual. Have you ever wondered what a crystal’s shape may mean or if it even has a meaning? Or maybe if it’s used in gridding? Well, let’s just see what our new crystals columnist Retha N. Lent has to say in her column Retha’s Crystal Reflections. We thank our readers so much for this award. We will continue to bring you great, informative reading material every month.